Today’s BREAD PAKORA EATING COMPETITION is a 5 Minute Food Eating Competition. 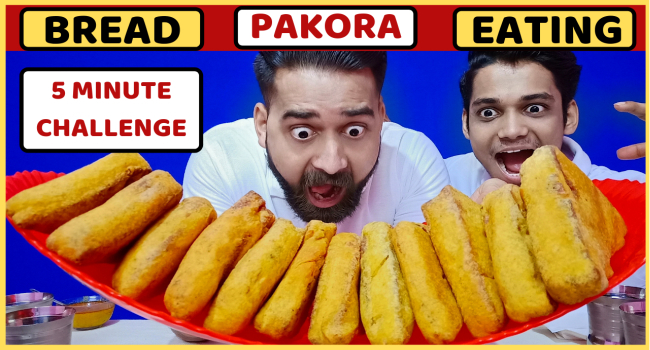 Watch full Food Challenge and enjoy this Bread Pakoda eating food Challenge Video. Hello & Welcome Friends on KulFiy.com, In this video, Me (Ashish) and My Big Brother (Ankur) are entertaining you by 5 Minute BREAD PAKORA EATING COMPETITION. Hope you will Like & Share this Food Eating competition. Both have 5 minutes to complete this Bread Pakoda eating food Challenge. The loser of this eating challenge will be punished by Bollywood Actors acting in different ways. KEEP WATCHING this Food Challenge & enjoy Bollywood actors acting Punishment.